I must hand it to this kid, this is a very creative idea on getting a ton of candy from a parade. It's simple, it's fun, it's challenging for those in the parade throwing candy to those along the parade route. 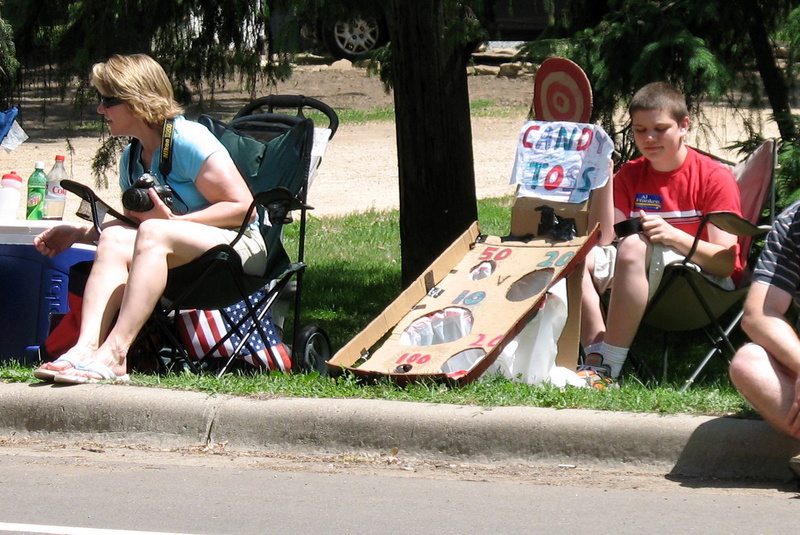 I watched several floats and vehicles from the Afton 4th Of July parade that were tossing candy to the curb, stop and throw several pieces of candy onto his candy game board. A few stopped until they scored points! There was no need for him to dash into the street to collect the treats as they all were throw directly to him. It was a brilliant invention! Everybody loves a parade!AND an entrepreneur. LOL that's great. Always refreshing to see young minds thinking out of the box. You have to like his inginuity. He'll go far in this world. Oh man... that is clever! Kudos to him! Anyone else notice the Al Franken Pin? Yup, that kid's gonna be a millionaire one day.